A no-fly zone has been imposed over parts of Northern Ireland, causing renewed disruption for air travellers. The move by the Civil Aviation Authority comes as a dense volcanic ash cloud from Iceland heads towards north-western parts of the UK. Belfast's airports are shut until 1300 BST. Dublin Airport is open despite some Irish Republic flight bans. The Isle of Man's Ronaldsway is closed. 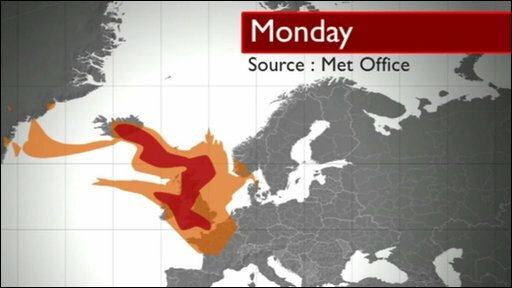 Forecasts say ash may extend over the UK on Monday and Tuesday. Travellers are being advised to check with their airline before leaving home. Jonathan Astill, from the air traffic authority, Nats, said: "Unfortunately, yet again, a mixture of volcanic activity and weather systems have conspired to bring a cloud of ash down towards the UK. "As a result we've now got a cloud of high density volcanic ash rapidly encroaching on Northern Ireland and the Isle of Man." The cloud is expected to lie over the London area by Tuesday, but is likely to have drifted out of UK airspace by Wednesday, forecasters say. EasyJet said it has so far cancelled 11 Sunday flights from Belfast International Airport. British Airways said all its flights were operating normally, adding that the situation was being closely monitored. The Department of Transport, which is establishing five-day ash prediction charts, is warning there is a chance airports in south-east England may be also be affected in the next few days. Transport Secretary Philip Hammond said the situation was "fluid" but passenger safety was the top priority. 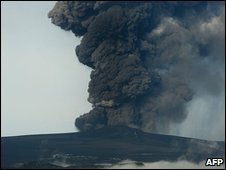 Prof Brian Golding, head of forecasting research at the Met Office, said the cloud stemmed from an eruption on Thursday. "The volcano has now dropped back in height. It did that yesterday, so the ash coming towards us for the future isn't quite so deep as it was on Thursday. "It isn't going to turn into a huge area and it's being blown eastwards, between south-east and east. " Meanwhile, Italy has fined Irish airline Ryanair 3m euros (£2.5m) for failing to help some passengers after cancelling their flights during the crisis. Ministers agreed on Saturday that the five-day forecasts, rather than 18-hour ones, would be made available on the Met Office website. The Met Office said its charts would be updated every six hours. A spokeswoman said the ash plume was currently about 25,000ft (7,620m) high, with winds blowing from the north west. But she said the wind was expected to change direction in the middle of next week, taking ash away from the UK. Scottish transport minister Stewart Stevenson called upon airlines to be "consistent" to "avoid unnecessary and unhelpful confusion". He said he had written to BA chief executive Willie Walsh after the airline cancelled three flights to Scotland on Friday. BA said the flights were cancelled as a "precaution". BA is facing industrial action in the coming days, potentially adding to travel disruption. Meanwhile, Network Rail said it was boosting services to and from Scotland, and to Irish Sea ports, with engineering works postponed where necessary. Italy's civil aviation authority fine on Ryanair comes after it said it knew of 178 cases of passengers who did not receive mandatory assistance, such as food - required under EU regulations - between 17 and 22 April. Ryanair called the allegation "complete rubbish".